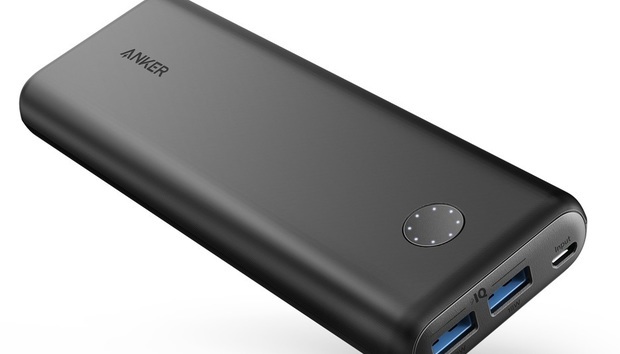 One brand that’s synonymous with inexpensive battery packs is Anker. It has built an entire brand around providing a quality user experience at a fraction of the cost of its competitors. The PowerCore II 20000 battery pack falls in line with that mentality. As the name implies, it’s packed with a 20,000mAh battery (72.36Wh). There are two USB-A ports, one with 12W output, another with 18W output. A single Micro-USB port is used to charge the PowerCore II itself. We were able to fully charge the PowerCore II in 5 hours, 25 minutes—about half the amount of time we expected for this capacity. According to Anker that time can dip to below 5 hours when using a Fast Charging wall adapter. Its overall efficiency came in at 83.77 percent, which is slightly above the overall average for batteries we’ve tested. On top of the pack is a round power button, encircled by indicator lights. Each light equals just over 10 precent of capacity, making it easy to quickly see how much power is left in the pack. The 18W port was able to fast charge the Samsung Note 8 without issue. The 12W port, however, did not trigger fast charging. Included in the box is the PowerCore II, a carrying bag, and a Micro-USB cable. What I like most about the PowerCore II is that it combines a high-capacity battery pack in a footprint that’s easy to tote around. It’s not going to weigh down your backpack, but it’s also something you won’t want to carry in your pocket at all times. Bottom line: Anker is arguably the leader in reliable battery packs and consistent design. The PowerCore II 20000 is no exception.